HIGH ABOVE THE CLOUDS: Jill and Reg in freefall after jumping from the Cessna. Thanks to Jill’s courage and determination and the wonderful generosity of our supporters, more than £2,000 was raised for Lymington Cat & Kitten Rescue – and that total went even higher once we had reaped the benefits of those donations that were Gift Aided. 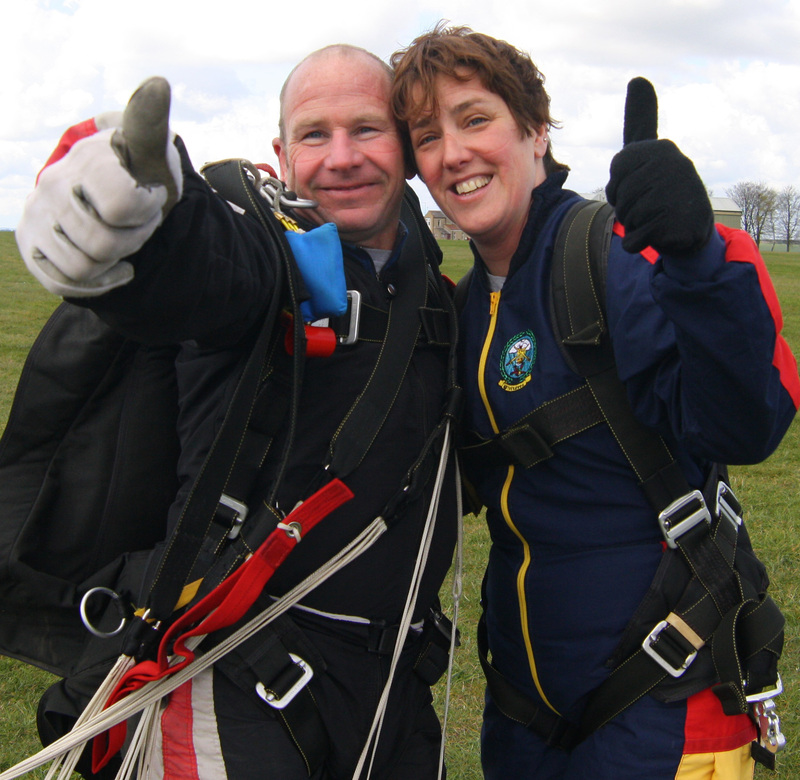 The idea for Jilly’s Jump was hatched just after Christmas 2011 when, during a casual conversation over a cuppa, the rescue helpers “brainstormed” ideas for fundraising. 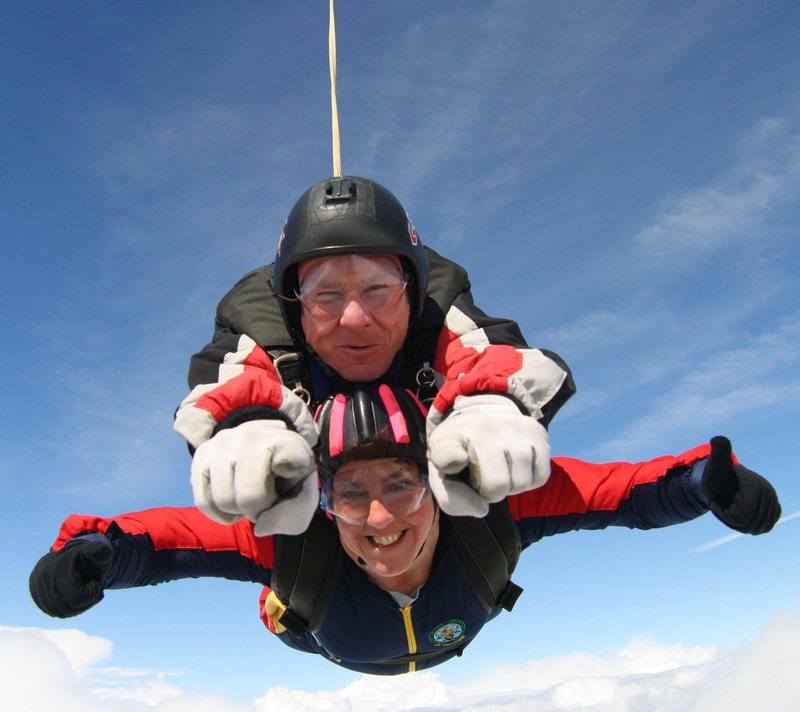 “I could always do a skydive,” offered Jill – and we almost choked on our chocolate cake when the penny suddenly dropped that she was deadly serious. 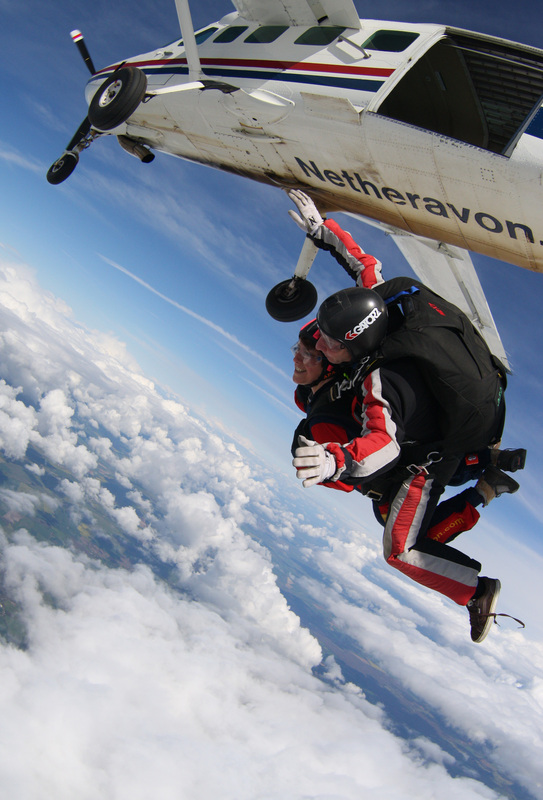 And so it was that intrepid Jill booked herself a place at Netheravon airfield on Salisbury Plain to do what most of us would want to avoid in our worst nightmares – jump out of a plane from two miles high. The Big Day dawned bright and breezy as Jill set off for Wiltshire with her “support crew” – her daughter Emily and son Dan, plus Janette and Jon from the rescue. The weather gods were certainly smiling on us because, after a week of showers, storms and squalls, the skies cleared sufficiently over the airfield to allow all 20 scheduled tandem dives to go ahead. 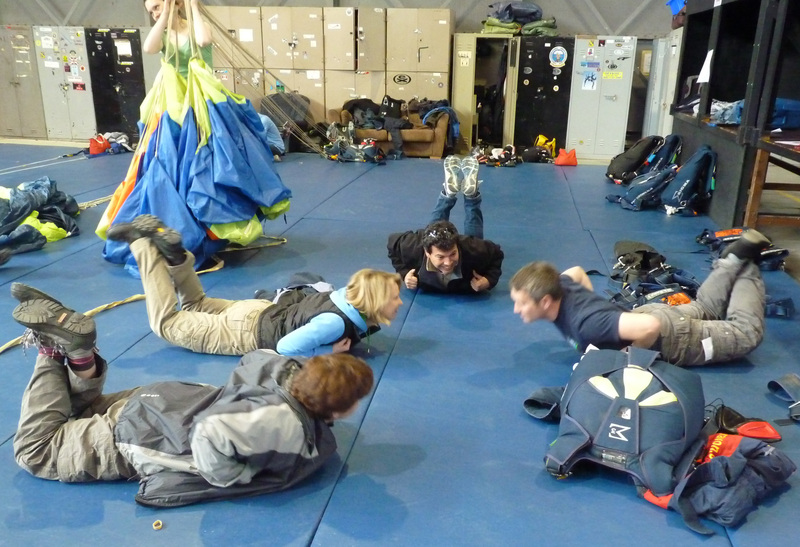 After completing her registration, Jill was ushered into a giant hangar where a senior member of the Netheravon crew gave 30 minutes’ ground training in what to do – and what NOT to do! – when it came to the real thing. Legs back, legs forward, arms outstretched, arms tucked in… the required actions for every single phase of the jump were detailed and demonstrated. ALL SMILES: In freefall at 100mph (regulated by the drogue chute – hark at us getting all technical! ), Jill enjoys the exhilarating descent from plane to plain. 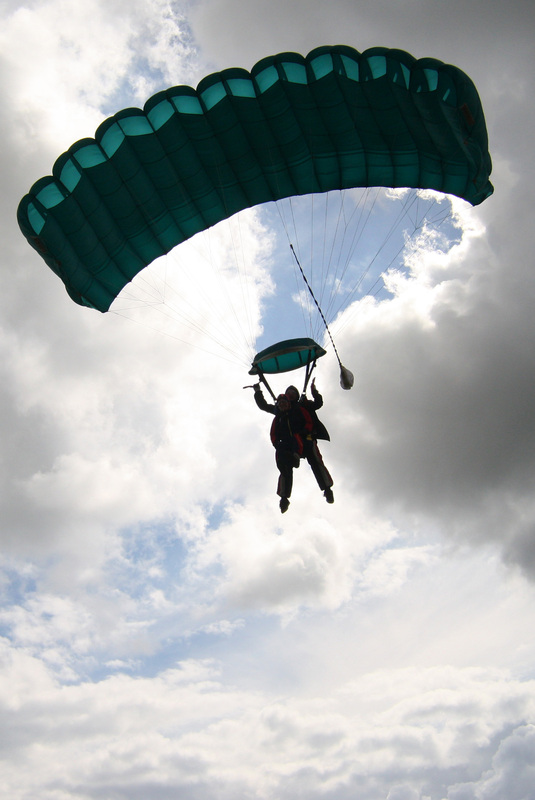 Reassuringly, all the jumpers were told that each para-pack had a back-up chute – plus a failsafe altitude sensor device that would automatically open the canopy in time if their expert accomplice forgot to! Training completed, it was time to reach for the jumpsuits and wait for the next available Cessna to whisk Jill into the air with her instructor Reg Green. And sure enough, within a matter of minutes the aircraft purred into view – there was no going back now! “That was the most frightening bit – waiting in the plane to jump and having to watch everyone else exit before me,” said Jill. PRACTICE MAKES PERFECT: Ground training for Jill and two of her fellow skydivers before the real thing. “Next thing I knew, I was sitting in the hatchway with my feet dangling over the edge, looking down, feeling the wind and knowing that I was going to be falling out there any second. As she and Reg prepared to jump, Jill’s in-flight cameraman Dave perched himself nervelessly on the hatchway to take pictures. And he was with them all the way down, simultaneously shooting stills and video footage to record the event for posterity. NEARLY THERE: Silhouetted against the clouds, Jill and Reg prepare for touchdown. Then came that life-affirming “drag” feeling as the chute opened and they began a euphorically slow descent towards terra firma – followed by a landing as smooth as the parachute silk itself. “When the chute opened there was a sudden silence instead of the wind rushing past and it felt like we were just hovering,” said Jill. “ In freefall we couldn’t hear anything and we just had to go by the signals which we’d learnt in our training, but once the parachute was open I could hear Reg speaking again and we could even have a conversation. 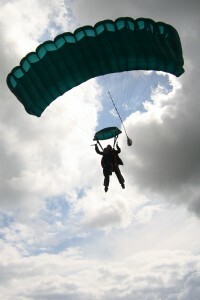 “I also got to have a go at steering the parachute, which was fun. Reg was showing me all the sights of Salisbury while we were floating around and it was very peaceful, very relaxing – a huge contrast to the rush of freefall. Lymington Cat & Kitten Rescue would like to thank all the staff at Netheravon for their friendly professionalism throughout a superbly organised event – they were faultless. Thanks also to Emily and Dan for providing priceless moral support to their mum, and to Emily for taking some excellent pictures from ground level. THUMBS UP: Jill celebrates her first skydive with Reg (who’s done 6,000 of them!). Most of all, though, our undying thanks and admiration go to Jill for volunteering, and for going through with it – not forgetting all the many wonderful supporters who have backed her so generously. We really appreciate it and we simply cannot thank you all enough.